On the face of it few businesses might seem less attractive than rat-catching and loo-cleaning, but few other FTSE firms can boast Rentokil’s (RTO) high operating margins or are world leaders in their field. Thanks to a mix of steady if undramatic organic growth and opportunistic bolt-on acquisitions, over the last five years Rentokil has turned itself into the global leader in commercial pest control. At the same time, Initial has grown to become the world’s biggest hygiene services business. There’s a strong logic to having these businesses under one roof. They tend to serve the same customers in the same areas which means they can share country management, administration, infrastructure and technology, which saves on costs. Also, both businesses are non-cyclical and are growing due to the same big industry trends, most obviously the need to prevent the spread of bacteria, germs and disease as populations grow and more people live and work in cities. According to UN estimates, by 2050 nearly 70% of the world’s population will live in urban areas compared with just over 40% in 1990. Most of that growth is expected to come from Asia and Africa. 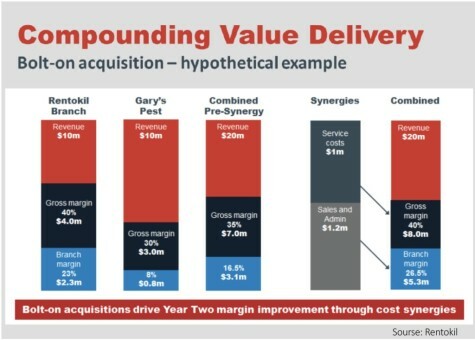 The pest control division, which accounts for 63% of sales and 68% of operating profit, operates in an $18bn global market which is seen growing by 5% a year for the next five years. Rentokil’s underlying sales are growing at the same rate but thanks to acquisitions total sales growth is much higher (13% in the first half of this year). On top of this, vector control is a rapidly-growing market already worth over $3bn globally. This entails preventing the spread of diseases like malaria and dengue fever which are on the rise due to climate change and increased travel. Rentokil has recently bought the leading US vector specialist VDA, giving it access to this key market. Meanwhile the hygiene services arm, which accounts for 22% of sales and 23% of operating profit, is a slower-growth but equally high-margin business. Again targeted acquisitions are propelling growth with two big deals announced in the last year, CWS in Italy and Cannon in the UK. WHERE DOES THE REST OF ITS MONEY COME FROM? The remaining 15% of sales and 9% of operating profit come from watering office plants, supplying work-wear and treating dry rot, collectively titled Protect & Enhance. While these businesses benefit from the group’s global footprint, they are non-core and some assets have already been sold or put into joint ventures. The UK property-care business, which treats dry rot and woodworm, has been struggling for the past year as the housing market has slowed and revenues are just 1% of the group total (£11m out of £1.2bn in the first half). With little sign of an upturn we wouldn’t be surprised if Rentokil sold this unit to a more natural owner like Homeserve (HSV) and re-invested in its higher-margin core businesses, as it has with Cannon Hygiene and more recently with the purchase of Mitie’s (MTO) pest-control business. Acquisitions are an important part of Rentokil’s growth strategy. Both pest control and hygiene are fragmented markets with hundreds of small competitors ripe for consolidating into Rentokil’s trusted-supplier model, and the company is often the ‘buyer of choice’ for smaller firms. By increasing scale and density, particularly in urban areas and emerging markets, the company can better leverage the benefits of scale. Another part of the growth strategy is investment in innovation, both in terms of products and technology. A third of new orders in its pest control arm are for new products and the relatively new online portal MyRentokil has been a big hit with around 80% of customers using it to monitor their products and pest activity. Unusual as it may sound, bed bugs are another growth opportunity. The potential market for a successful ‘smart’ solution is huge as there are 17m hotel rooms across the globe and traditional tools for treating the problem are very hit-and-miss. One US hotel chain is already piloting Rentokil’s bed-bug monitoring scheme across 1,000 of its rooms. Investors have given Rentokil something of a cold shoulder in recent months but we note that the shares jumped last week on the news of the Mitie deal while those of Mitie dropped, which suggests that investors are warming to Rentokil’s growth story again. Analysts are more positive than negative with eight ‘buy’, four ‘hold’ and just two ‘sell’ ratings but they haven’t pushed the boat out with their price targets as the 12-month consensus is just 14% above the current share price at 370p. Sales and earnings estimates for this year and next year have been creeping up slowly over the summer but again analysts aren’t overly bullish so it looks as though there is room for more earnings upgrades.